High Definition Optics delivers clear, crisp, outstanding vision with design advances for improved comfort and breathability. Reduced halos and glare and deliver the clear, crisp vision. PureVision2 lenses with High Definition Optics are designed to reduce halos and glare and deliver the clear, crisp vision that you should demand. Plus, this monthly replacement lens offers design advances for outstanding comfort and breathability. With a thin, rounded edge, PureVision2 HD enables a smooth, gentle lens/lid interaction for soft, comfortable lens wear. PureVision2 HD is one of the thinnest lenses on the market today, yet it's remarkably easy to handle. PureVision 2 HD has design advances for improved comfort and breathability. 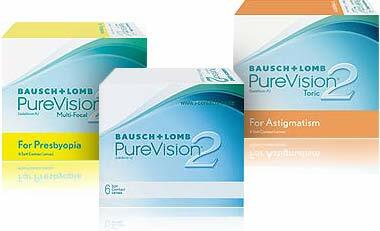 PureVision 2 HD contact lenses are designed to reduce spherical aberration across the entire power range. PureVision 2 with High Definition Optics design at -1.00D reduces spherical aberration better than other lenses. These lenses are packaged in a unique solution featuring poloxamine – a moisturizing surfactant – designed to deliver outstanding comfort on insertion. PureVision2 HD For Astigmatism contact lenses feature Auto Align Design™ that works with your eyelids to keep your lenses in place, so you get incredible vision no matter what you’re doing. High Definition™ Optics designed for Astigmatism. Auto Align Design delivers uninterrupted vision at all times for the majority of patients. Auto Align Design reduced blurriness and haziness that can be associated with sudden movements. For a nearsighted person, close objects are clear, but distant objects are blurred and difficult to distinguish. Almost the opposite, for a farsighted person, distant objects may be clear but up close objects may appear blurry.